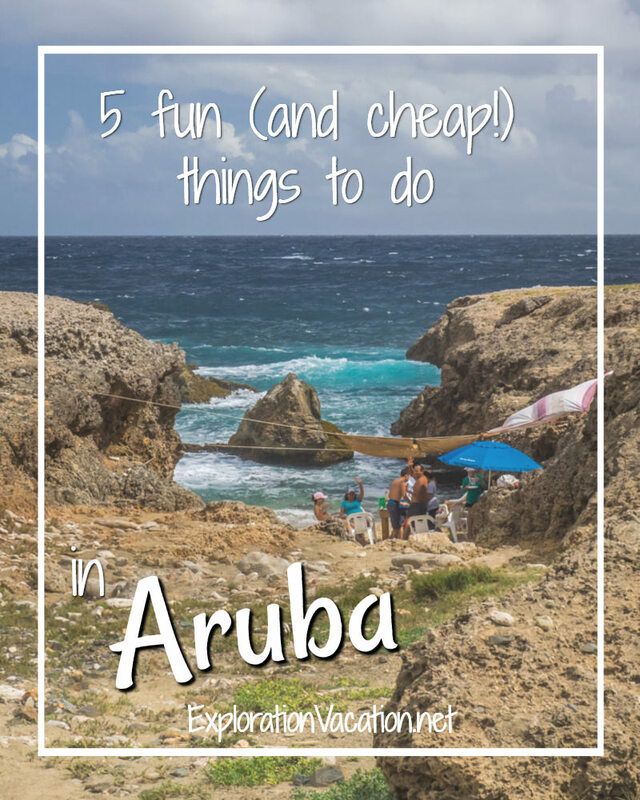 Seeking out the best cheap things to do in Aruba stretches your vacation budget without shortchanging you when it comes to fun in the sun. After all, fun doesn’t have to be expensive! Aruba is a great place for a warm weather vacation, but it isn’t a particularly cheap winter get-away. However, some of the best things to do in Aruba cost little or nothing. The following five inexpensive activities will keep you busy in Aruba without spending a lot of money. No surprise here, but the best fun and cheap (free!) thing to do in Aruba is to spend a day at one of the island’s great beaches. Whether you want to swim, snorkel, take in the sunset, or just watch the action, Aruba has a beach for you! And, best of all, beaches are open to the public at no cost. Palm Beach may have the island’s most perfect stretch of sand and sea. However, it’s lined with high-rise hotels and condos, making Palm the busiest beach on the island. If you want a beach party, this is the place to be. Eagle Beach is often cited as the most beautiful beach on Aruba. It’s easy to see why, with a wide white sand beach and crystal-clear water. But this is another beach that can get really busy – get there early to claim a beach chair in the perfect spot. Baby Beach was our favorite. Popular with island residents and far from the noisy water toys that race around many of Aruba’s most popular beaches, we loved swimming in this protected cove almost as much as we enjoyed watching the local children play, While not as scenic as the island’s other beaches (the now-closed refinery can be seen in the distance), the sand is just as soft and the water as clear as at any beach we visited. Located on the south end of the island, it’s far from most tourist hotels or development of any kind. Windy Boca Grandi isn’t suitable for swimming. However, it’s a great spot to watch kite surfers practice their sport. (Lessons are available, but they aren’t cheap!) Pack a picnic lunch if you plan to stay for very long. There are many other beaches as well, with most of the best beaches for swimming located near tourist hotels. Cost: Beach access is free. There may be a parking charge at some beaches in developed areas. Cabanas and beach chairs are available at most beaches for a small charge. Note that Renaissance Beach (famous for its pink flamingos) is a private island and is NOT free unless you are staying at the Renaissance Hotel and Resort. While most visitors come to Aruba for its dreamy beaches, most of Aruba (and about half of the island’s coastline) is rugged. 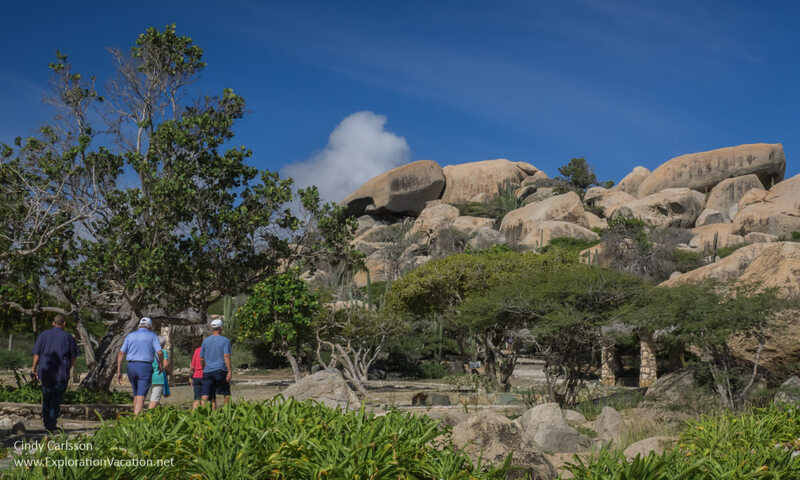 The best place to explore this side of Aruba is Arikok National Park. 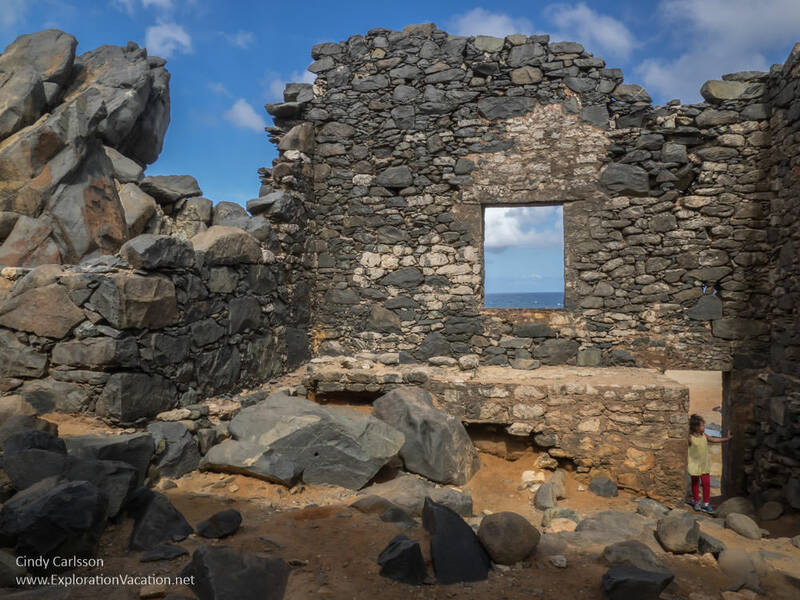 With almost 20% of the island is preserved as part of the park, Arikok offers options for everyone. There are scenic viewpoints, hiking trails, picture perfect beaches for picnicking (all of the park’s beaches have dangerous currents, making them unsuitable for swimming), crashing waves, sand dunes, caves, a natural pool for soaking, ruins, and Arawak pictographs. You’ll need a car (a 4×4 will let you explore everywhere, while a regular car will give you access to parts of the park) or mountain bike to fully explore the park. Plan on spending at least a half-day here. Cost: At $11 per person, Arikok National Park isn’t free. But it’s a small price for a full day of activities! For a quicker and cheaper (free!) option, visit either the Ayo or Casibari rock formations in the center of the island. The San Nicolas Art District offers a larger-than-life open-air gallery of colorful murals. 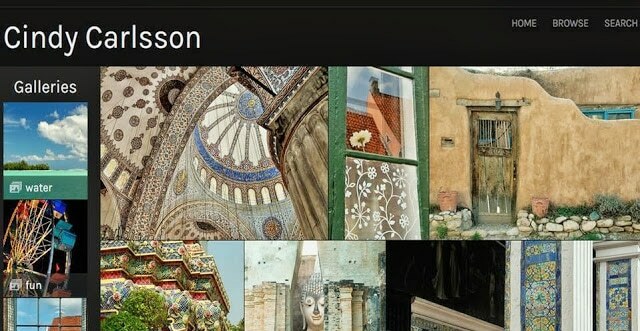 There’s no charge to wander the art-filled streets. 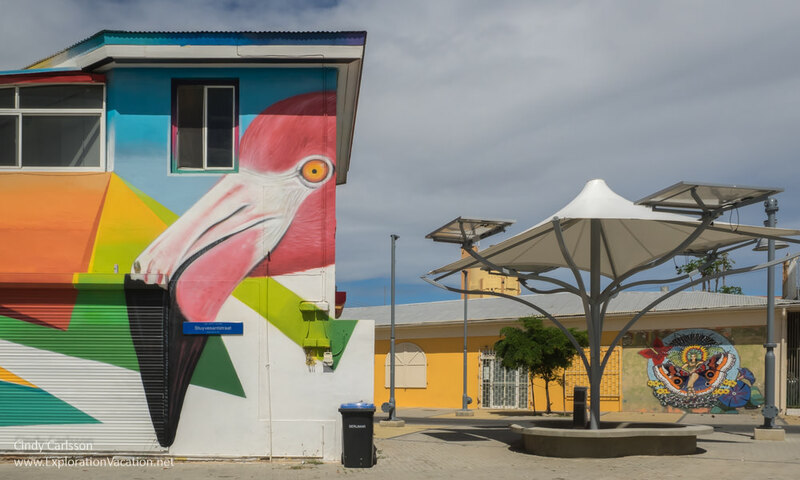 And, with the Aruba Art Fair Mural project adding new pieces each year, there’s always something new to see. San Nicolas is located Just 30 minutes south of Oranjestad on the southeast end of Aruba. There is little tourist development in the city (this is where Aruban residents live), but the city is served by local buses and taxis. You’ll see a few of the murals as you drive through town. But most of San Nicolas’ street art is located along the plazas and side streets just off the main road in the heart of town. Usually there is plenty of parking along the street, making it easy to stop and take a closer look at the town’s colorful buildings. Cost: Free unless you have to pay to park at a meter. 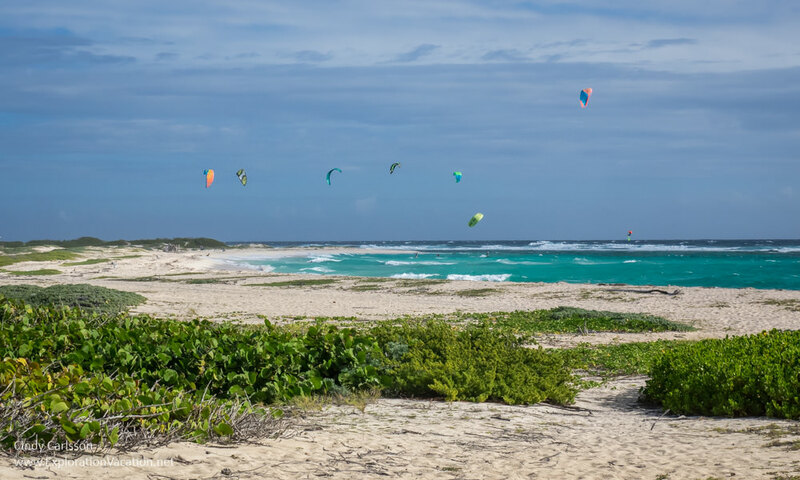 Before tourists came to Aruba in search of the perfect beach, adventurers came seeking gold. The 19th century saw a mini gold rush on the island when the gleaming metal was discovered here in 1824. Today visitors can explore the remnants of those days at several ruins. The remains of historic gold mines can be seen at Miralamar. In addition, visitors can clamber around Bushiribana and Balashi, two ruined mills that once processed gold ore. Cost: Bushiribana and Balashi are free. The Miralamar mine is in Arikok National Park, so visit it along with the rest of the park to make the most of your park fee. 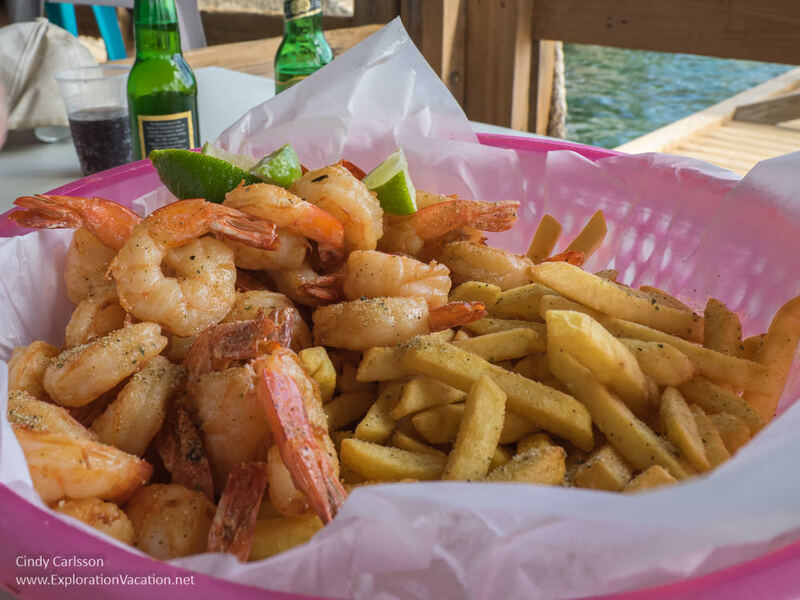 You’ve got to eat while you are on Aruba, and there’s no better affordable meal on the island than a basket of fish or shrimp at Zeerovers. Located just off the main road to San Nicholas, Zeerovers serves the fried fish of the day and shrimp with a variety of side dishes. It’s all available for take-out, but the best option is to eat at one of their sheltered seaside tables. There are even a couple of tables on the dock by the fishing boats that caught your meal! Because it’s a local favorite, lines can be long at Zeerover. Have someone get your drinks from the bar (where the line is usually pretty short) and then enjoy them while you wait to order your meal. Cost: Prices are set for local residents, so much lower than restaurants in tourist areas. Fish and shrimp are priced by the pound and sides are priced by the item, so the price is determined by how much you order. There is also a bar with all the typical tropical drinks available at a low price. 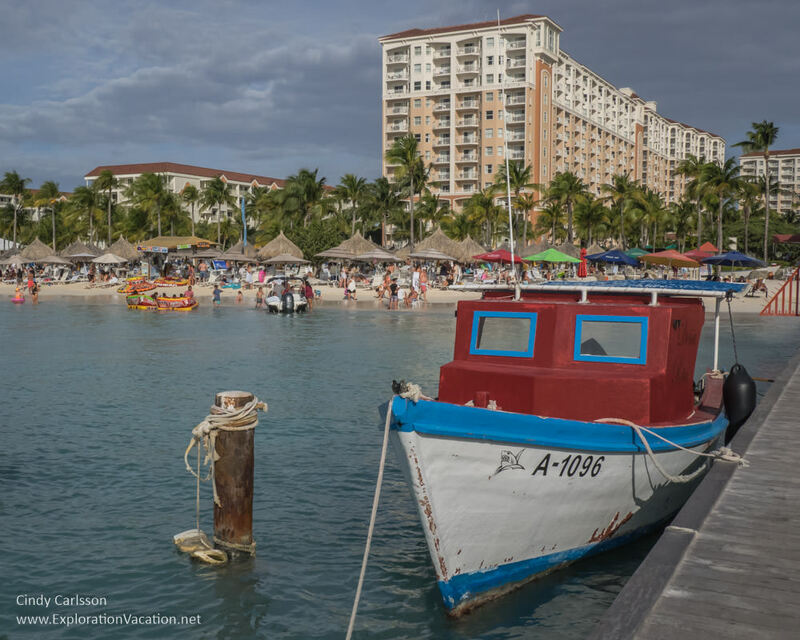 For more information on Aruba, check my Itinerary for two weeks in the Caribbean’s ABC islands.